…and she wants everyone to stay that way. Lots of people, even many many conservatives, loved the patriotism that came from the mouth of Khizr Khan at the DNC tonight, but not Ann Coulter. At some point, Coultergeist – a childless, never-married, 54-year-old pusher of the political party that desires government to enforce certain christians’ notion of ‘traditional family values’ against the entirety of the populace with the power of the sword – is going to belch out something that will actually justify all of the transphobic slurs that get hurled at her. I don’t think this is yet it – but the distance between her and that point can now be measured only in microns. Note: This is a special guest post from nationally-prominent, Houston-based trans rights activist and historian Cristan Williams. If you think of yourself as an LGBT ally and you didn’t vote or voted against LGBT equality, I don’t consider you to be an ally. When we needed you the most, you either couldn’t be bothered or you chose to stand with the people who hate us. Either way, your actions made it possible for hate win the day. People who support that type of hate on that level are not, in any sense of the word, an LGBT ally. More specifically, you chose to turn you back on women, the differently abled, racial/ethic minorities, vets and more. The game the anti-HERO folks played was first used in Houston by the Klan who marched around saying LGBT equality = child endangerment back in the 80s. 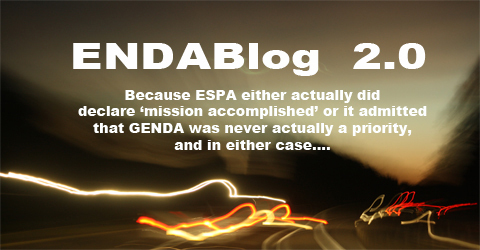 For the past year+ they used the Klan’s strategy against equality and Klan values won. That’s not hyperbole. 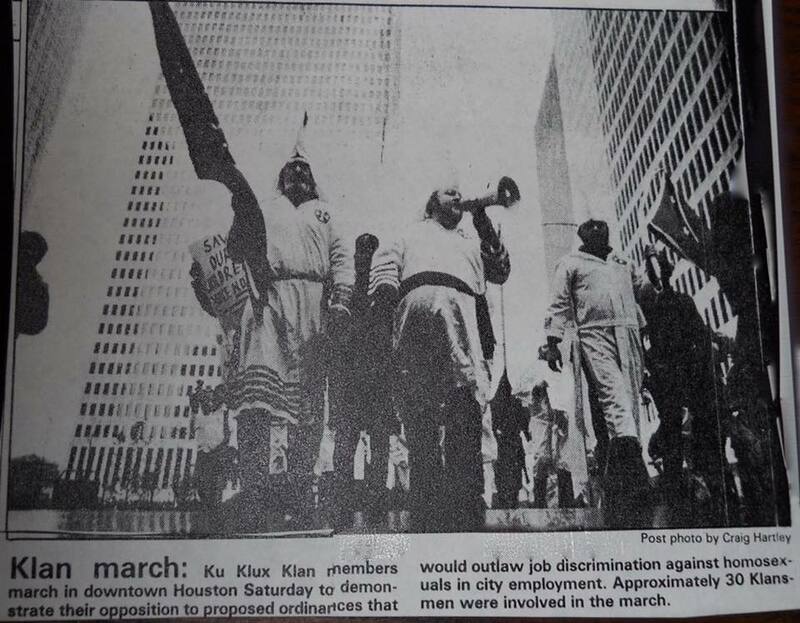 Here’s a picture of the Klan from the 80s, marching against Houston LGBT equality carrying signs that read, “Save Our Children Vote No”. The anti-HERO campaign used the Klan’s playbook and it worked. Not voting or voting against prop 1 was to support the Klan’s Houston and if that’s what you did, you are no ally. Allies don’t behave like that. I encourage you to – at a minimum – learn the difference between the politics of the Klan and a 21st century Houston. I am, of a fundamental level, disappointed in you. This is a wrong that can’t be easily righted. The wound you helped inflict on the hearts of the people you claim to care about can’t be healed. It will always remain and we will carry it all of our lives; it will never stop hurting. Yes, I believe that at some point in the future, maybe many decades from now, we will pass a HERO. Just know that when it happens, for people like me, it will be bitter-sweet. It won’t change the reality that so many of you chose in 2015 to allow those who hate people like me the most to perpetrate such a public violation. How Much Does it Cost for HRC to ‘Blast’ Something? In yet another anti-LGBT move this year, lawmakers in the North Carolina House of Representatives pulled a sneak attack through an amendment that would strip away the ability of local municipalities to enact ordinances prohibiting discrimination based on sexual orientation or gender identity. The Human Rights Campaign (HRC) blasted the last-minute amendment and called upon lawmakers to reject the bill. I can hear the North Carolina Legislature withdrawing the bill now – and all without anything being done that will detract from Chad Griffin’s salary!